Today the national news covered the story about a security guard sitting in a golf cart at the back of MGM Grand who suffered a ravage and senseless attack by a group of youths. He was lucky, very lucky to escape without serious injury – if you call bruises plus a broken jaw and collar bone not serious. The melee was caught on a security camera and was played later on CNN and other major news agencies. 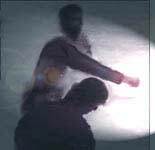 When I looked at the images, a couple of important self-defense lessons seemed to jump out. His first actions contributed to the attack, although his final actions just may have saved his life. Here is how the action came down. The security guard was sitting alone in an isolated area late at night near an entrance to a parking garage behind the MGM Grand – not smart. If he had been accompanied by a co-worker the probability of the attack would have diminished. Even better, he should not have been there at all. One youth, it was reported, took something from the cart as he walked past it. In response the guard got out, took out a cell phone, turned his back away from the cart (exposing it), looked down and started dialing – stupid. At a moment calling for increased vigilance, the guard narrowed his focus to dial, thus eliminating any awareness of what was going on around him. The result was that one youth was able to circle around the front of the cart behind the guards back and then hit the guard in head with a looping outside punch that the guard never saw coming. The attacker then followed up with relentlessly flurry of left/right punches that pummeled the guard (who bent back over the cart trying to defend himself). If the guard had seen the youth, the youth most likely would have not attacked and the whole ruckus might have been avoided. Potential attackers are empowered by the ability to surprise. They have confidence in a sudden overpowering ambush. Most, however, are much more reluctant to attack someone who is aware, who might defeat their attack and hit back. In short – the guard virtually invited a sudden attack. This probably triggered the group attack that followed. The guard was not initially severely injured and was able to try to run away – good. If there had only been a few attackers, he might have succeeded in escaping. He might have reached safety. As an alternative he could have used an old Roman strategy against multiple attackers -- to run, then after some distance, suddenly to turn and attack the person right behind – who is often the strongest. Then attack the next and next –each counter attack against a single opponent. The idea is to string attackers out so you fight just one at a time. But here there was a swarm – there was no chance to fight back effectively. The guard reacted by falling to the ground and curling up in a fetal position with his hands in front of his head – not an ideal position but the best possible against an overwhelming group attack. In this position vital organs and the head are protected while the attacker’s weapons are limited – usually to kicking. In this case one youth was seen using his belt (maybe a chain) to whip down, but this had no severe consequences. Falling to the ground does two things. First, it is less fun for the attackers. It also signals their triumph, and this often is reward enough. They go on. This action also signals some form of instinctual compliance – possibly calling up inherited biological reaction. This is often seen with animals in a fight, when one submits to the other’s dominance by going to the ground and exposing its vital area. With dominance achieved, the fight ends. The lessons from this episode are many. 1-Be aware at all times and be prepared to defend yourself. 2-Don’t needlessly expose yourself to danger. 3-When in an isolated urban area, friends and accomplices are a good thing. 4-If in a potentially vulnerable situation, move to avoid any conflict – walk the other way, find safety in a store, inside a business or run. Don’t be macho and feel invulnerable. Don’t be so unaware as not to act. Don’t wait for an attack to catch you first. 5-Even if you can’t physically get yourself out of danger, your very awareness and preparation for possible attack will signal to potential attackers that you are not vulnerable and possibly not an easy target. This alone will forestall many attacks. 6-If the attack is overwhelming and you can’t escape, go to the ground. Assume a fetal position (balled up –ideally with your back protected against a wall or large object) with your arms protecting your neck and head. Yell for help. (1) This is not an actual photo of the attack featured in this article, but is instead a graphic representation of the first punch launched on the security guard who had been focused on dialing his cell phone. (2) Neither the author or FightingArts.com means to suggest that Las Vegas is any more dangerous than any other urban areas in US. The title and commentary only suggest that in any urban area dangers exist including physical ones. Christopher Caile is the Founder and Editor-In-Chief of FightingArts.com. He has been a student of the martial arts for over 47 years. He first started in judo. Then he added karate as a student of Phil Koeppel in 1959. Caile introduced karate to Finland in 1960 and then hitch-hiked eastward. In Japan (1961) he studied under Mas Oyama and later in the US became a Kyokushinkai Branch Chief. In 1976 he followed Kaicho Tadashi Nakamura when he formed Seido karate and is now a 6th degree black belt in that organization's honbu dojo. Other experience includes aikido, diato-ryu aikijujutsu, kenjutsu, kobudo, Shinto Muso-ryu jodo, kobudo, boxing and several Chinese fighting arts including Praying mantis, Pak Mei (White Eyebrow) and shuai chiao. He is also a student of Zen. A long-term student of one branch of Traditional Chinese Medicine, Qigong, he is a personal disciple of the qi gong master and teacher of acupuncture Dr. Zaiwen Shen (M.D., Ph.D.) and is Vice-President of the DS International Chi Medicine Association. He holds an M.A. in International Relations from American University in Washington D.C. and has traveled extensively through South and Southeast Asia. He frequently returns to Japan and Okinawa to continue his studies in the martial arts, their history and tradition. In his professional life he has been a businessman, newspaper journalist, inventor and entrepreneur.